At around the same time as I read the Body Ecology Diet in 2007, where I learned about making fermented coconut pudding (by blending coconut meat with coconut water and adding a culture), I was introduced to blended coconut water and coconut meat smoothies by Melvin, the legendary juice man who used to work at my local health food store in New York City, Lifethyme Market and has now gone on to open two of his own juice bars. Melvin also introduced me to the idea of adding greens to the coconut, such as kale, chard and collard greens, so I would get my greens and healthy fat (to absorb the vitamins), all in one. It also tasted divine. 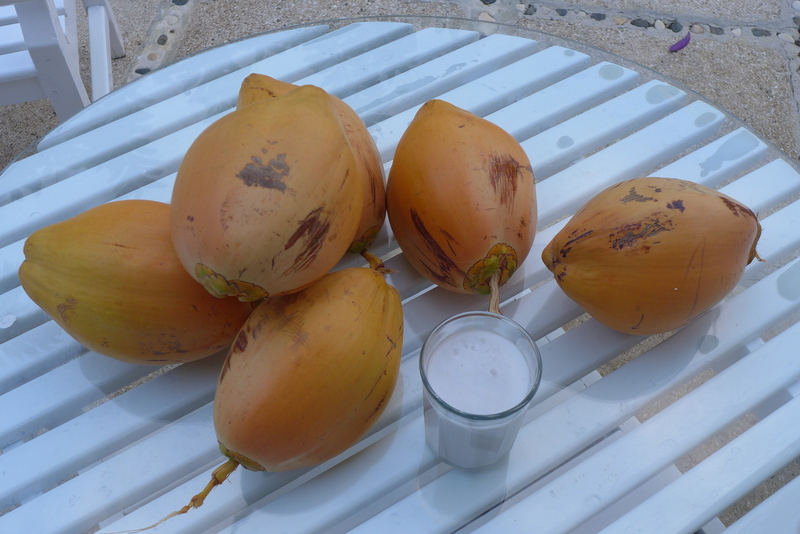 Ever since then, young coconut smoothies, either pure or mixed with greens, have been a part of my regular health routine. When I started weaning my daughter, puréed coconut meat was one of the first foods I gave her and she loved it. Sometimes I buy my own coconuts and make smoothies at home, or if I am in a rush I will buy a smoothie at one of my local juice bars. Now that I live in Miami where coconuts grow (!) I buy coconuts from my guys, Kokonut Kreationz at Glaser Farmers’ Market, or I will buy a coconut smoothie from Jugo Fresh. When I am in Jamaica, a local man named Lindsay delivers coconuts to us (the gorgeous yellow dwarf variety coconuts pictured above) or I get them delivered from Pantrepant Farm or buy them at a roadside fruit stall. In New York I go to Juice Press or Organic Avenue where they make and bottle coconut smoothies and call it ‘coconut milk’. Wherever I am, I’m never without my coconut smoothie. Select a fresh young coconut. If you don’t live in a tropical climate where coconuts grow, you can buy 100 percent certified organic packaged young Thai coconut meat and bottled water from Exotic Superfoods. Though not as fresh, they are the only certified organic young coconut meat source in the U.S and Thai coconuts are more flavourful. Do not buy the Thai coconuts you find in health food stores which have the husk shaved down to a white cone shape as they are sprayed with fungicide, dipped in preservatives and are up to 2 months old. They are far from fresh or nutritious. Chip the top away, turning the coconut to cut all around the top, using a cleaver or machete until you make a small hole through the hard inner shell. Pour the water into a blender. Slice the coconut in half and scoop out the soft meat with a spoon. Put the meat in a blender and blend the meat and the water until it forms a smooth consistency. Note: There is a difference between young and mature coconuts. The young ones are green or yellow, they contain a lot of water and the meat is soft and able to easily be scooped out with a spoon. The mature ones are brown and dry, have little water and the meat is hard and difficult to remove. It needs to be cut out with a special curved knife. The mature coconut meat produces a rich oily cream called coconut milk by grating the meat and squeezing out the cream with a cheese cloth. There are two juice bars in Miami that use mature coconuts to make milk: Milk Gone Nuts and Athens Juice Bar.